Maven was told they would have to rebuild their custom eCommerce web application in another technology stack, but we knew we could refactor it to work better without completely rebuilding it. So, we took over this project and now work with them regularly. For example, we were able to refactor the back end of their website to allow us to add products more easily. We did this with their brand new sighting scope product below. 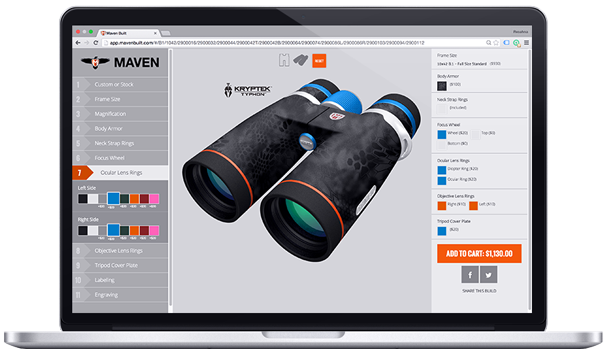 Maven’s Sighting Scope from Revive Design Studios on Vimeo. Refactored their web application to work with the eCommerce API in a more efficient way. For them this means: faster loading times for customers, the ability to update more of their own content, and saving a great deal of headache and expense in what it would have cost them to completely rebuild. We saved them hours each week in sending orders to vendors and reduced the number of costly mistakes by adding in a pdf export feature. Restructured their Google Analytics setup to allow them to view a customer at any conversion point across 3 servers. Their data is now more accurate than ever, which has enabled them to make better business and marketing decisions. An eCommerce site needs constant attention. It’s important to keep things like, conversion rates (at multiple conversion points), average order value, website speed, backups, and event tracking on your radar. These are the types of things we do for Maven and we’d be happy to work with you too. Get in touch to explore how we can help your eCommerce website be more successful. Faster loading times for customers. We’ve streamlined how they submit orders to vendors, saving them hours each week and reducing the number of costly mistakes. Restructured their Google Analytics setup so their data is now more accurate, enabling them to make better marketing decisions.